The SUN USB Rackmount Keyboard Mouse Drawer combines a SUN USB keyboard and a touchpad mouse in a space-saving 1RU industrial-strength drawer. 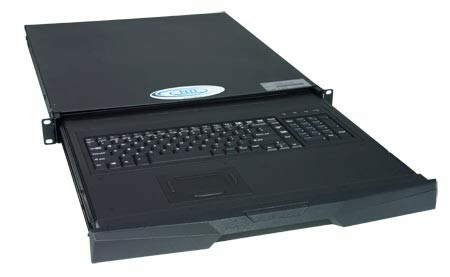 Also known as: rackmount keyboard, rack mount keyboard shelf, rackmount PC keyboard drawer, rackmount USB keyboard mouse drawers, SUN USB keyboard mouse rack tray. Designed to fit in a standard 19" (483 mm) rack/cabinet. SUN USB keyboard integrated with touchpad. Compatible with all USB-enabled SUN, Windows, Linux, Apple, IBM and HP computers. 104-key SUN-compatible keyboard for the SUN USB drawer. Supports SUN keys, including Stop, Cut, Paste, Compose, etc. Drawer is adjustable to various rack depths from 21.6" (549 mm) to 31.3" (795 mm). Operating Relative Humidity: 10 to 85% RH.